MONACO (AP) When Charles Leclerc races for the first time at the Monaco Grand Prix on Sunday, he will carry with him the memories of his father and his close friend Jules Bianchi. The 20-year-old Leclerc will become the first driver from Monaco to race on the famed track since Olivier Beretta in 1994. ”I have been waiting for this moment since I was a child,” Leclerc said. He knows the track’s sinewy streets off by heart, walking along them countless times growing up in the tiny Principality. As a small boy, he watched his first Monaco GP in an apartment overlooking the famed first turn at Sainte-Devote. It’s hard to be more Monegasque than Leclerc. His apartment is near the race start-finish line. As a youth, he swam in the swimming pool next to the glittering harbor, the focal point of the track. The harbor showcases the most spectacular yachts on the French Riviera – and therefore in the world. When he was 12, Leclerc met Prince Albert in the imposing royal palace, perched on a hill and towering over the harbor’s inviting waters. Leclerc is tipped to go far, held in the highest regard by four-time F1 champion Sebastian Vettel. After joining the prestigious Ferrari academy in 2016, Leclerc won the GP3 title at the first attempt. Ditto last year, when he clinched the F2 title. It fast-tracked him into F1 with Sauber, which uses Ferrari engines. Leclerc finished an impressive sixth at the Azerbaijan GP last month. 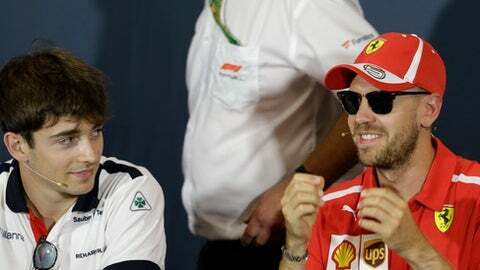 There is speculation Leclerc could even replace veteran Kimi Raikkonen at Ferrari next year, and race alongside Vettel. Although a move to Ferrari seems somewhat premature, Leclerc has eye-catching quality. Leclerc does not seem likely to get carried away, given how his life has been tinged with sadness. Although they were several years apart in terms of age, he was childhood friends with Bianchi – an aspiring young driver growing up in nearby Nice. Bianchi was like a mentor to Leclerc. When Leclerc started go-karting at the age of four, it was on the track owned by Bianchi’s father. He was a close friend of Leclerc’s father, Herve, who raced Monaco in the F3 category 30 years ago. Bianchi died in July, 2015 after a long battle to recover from head injuries sustained in a head-on collision at the Japanese Grand Prix in October 2014. He was 25. It was a crushing loss and hit Leclerc very hard. Bianchi secured a ninth-place finish at the 2014 Monaco GP for the unheralded Manor Racing team. Considering he had arguably the weakest car, on the most difficult track for overtaking it was a phenomenal drive. He was touted as a future driver for Ferrari. That mantle now rests with Leclerc, whose talent is matched by his courage. Leclerc’s father died in June last year, a few days before the F2 Azerbaijan GP. Leclerc raced, despite his grief, took pole position and won. At this weekend’s Monaco GP, he is carrying tributes to his father and to Bianchi on his race helmet. ”It was our dream to be one day racing in Monaco and I’m pretty sure Jules and him are watching from above,” Leclerc wrote on Twitter.